You can’t help but wonder what dreams and plans there were for that boy. He was born 190 years ago yesterday, on the 13th of June 1824. His parents, Josias and Nancy (Parks) Baker named him William H.1 — and nobody today knows what the H stood for. William wasn’t the first-born child of this couple. He had three older sisters — Mary, called Polly, born in 1817; Elizabeth M., sometimes called Milly, born in 1819; and Nancy Caroline, called Caroline, born in 1822.4 But he was the first-born son. And perhaps especially in farm families like the Bakers, and perhaps even more especially in families with many daughters, a son occupies a special place. Did the family start to breathe easier when William became a teenager in 1837? When he turned 14 in 1838? You can’t help but wonder, did they celebrate his birthday when he turned 15 in 1839? Because you can’t help but wonder what plans and dreams those parents saw when they saw their boy growing up tall and strong and so very close to manhood. And you can’t help but wonder what dreams and plans died when William died. There’s no record of what caused William’s death. No record of where William was buried. And nothing, beyond our imaginations, to tell us exactly what dreams and plans died with that boy, born on a June day 190 years ago yesterday. You’re lucky to have the family bible, Judy. 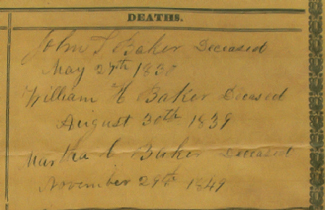 The only mention I have found of one of my great-grandmother’s step-brothers is in two letters she wrote. Charley Clasby was born between July 1870 and July 71 and died before 1880. We really are lucky, Ginny, and even luckier that Josias’ descendants donated the Bible to preserve it. I am one of the fortunate ones to have copies of journal pages written by my 2nd great-grandfather, Isaac Newton Carr. In one of his entries, dated January 11, 1879, he wrote about his son, Ezra, dying from what they thought was “the diphtheria croup” — six days shy of his fifth birthday. The journal entry was very long and sorrowful. It even detailed little Ezra’s last words. It was all I could do not to let my tears fall on his journal page. I’ve finally started a blog to capture a lot of Isaac’s more interesting journal entries beginning with his service in the Union Army in 1861. I’ve got a long way to go. There are 29 journals preserved, which run from 1861-62 and 1865-1923. They document his war experiences followed by his life as an Iowa farmer and businessman. This is a truly remarkable collection and I’m blessed to have found it. By the way, I see that your SLIG class is almost sold out this first day of registration. Congratulations! I’ve never seen three SLIG courses sold out within the first couple hours. That’s a record! I remembered that you promoted the DNA courses in your blog. One is already sold out and the one I signed up for only has 6 seats left. Yes, the SLIG lineup for 2015 is truly amazing — and the seats are going going gone! in many classes. Glad you got into the one that you wanted.